The strong gusts were slapping me in the face and throwing me off balance, and the wind had taken hold of my chalk bag and was dumping the contents of it into my eyes. For the last 20 minutes, I'd been flailing up a severely overhanging single-pitch crack called FM (5.11c) at Elephant Buttress in Colorado's Boulder Canyon. It was foolish to be out, and to make matters worse, we were climbing in the cool shade where it was about 45 degrees Fahrenheit with 40 mph gusts. Conditions were so bad that earlier in the day a friend had canceled with the text: "I'm too scared. No." But alpine climber Paul Gagner came out anyway, and we often climbed in nooks protected from the wind. The hope was to get on FM once the winds died down, but that didn't happen, so we faced the gusts and went for it anyway. Strong winds and cold temps were ideal testing conditions for the Black Diamond First Light Hoody. I kept the jacket on all day because it blocked out the cold and wind and kept in the warmth. That day I never overheated or got uncomfortably cold. 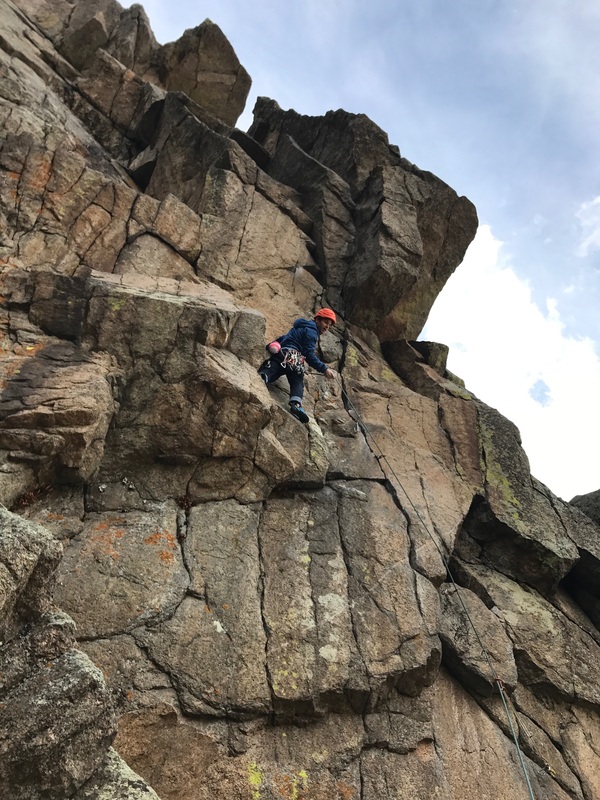 After wearing the First Light over eight months for ice climbing, cold-weather bike rides, runs (down to 0 degrees) and backcountry snowboarding, I still hadn't gotten the chance to rock climb in it. Or rather, I'd chosen not to because I generally shed jackets before climbing (especially when cragging) unless they're low bulk, which the First Light is not. However, for backcountry and general use, where I prefer active insulation, the First Light Hoody is solid. Compared to the other active insulation jackets I've climbed in, the Patagonia Nano Air (345 grams, 60 gsm of insulation) and Rab Strata Hoody (465 grams, 80 gsm; discontinued), the First Light Hoody (510 grams for size medium, 60 gsm of insulation) is the heaviest and bulkiest. This isn't to say it's bad, but perhaps climbing is not its strongest suit. Paul and I returned to the route the next day when the winds died down. Once again I zipped up in the First Light Hoody, got back on the climb and fought like hell only to take several 20-footers onto a finger-sized cam. That day I overheated a few times, especially mid-crux. Despite heavy thrashing up the route, and grinding my right shoulder into the rough granite—this after months of general use—I have yet to see any visible wear in the First Light. The First Light's face fabric is stretch-woven Schoeller (80 gsm, 93 percent nylon, 7 percent elastane), which is durable, breathable and is treated with Nanosphere Technology to repel water, dirt and oil. The jacket's warmth comes from (60 gsm) synthetic migration-resistant PrimaLoft Silver Insulation Active. This insulation is water resistant, breathable, lightweight, soft and packable. On its website, Black Diamond calls this jacket "our most breathable insulation piece." The First Light Hoody is constructed with primary fabric that is Blue Sign certified, meaning Schoeller adheres to a process that "eliminates harmful substances right from the beginning of the manufacturing process and sets and controls standards for an environmentally friendly and safe production," according to BlueSign.com. The athletic-fitting jacket has a stretch-mesh internal chest pocket and two non-mesh pockets on either side positioned down by the hips. The chest pocket (with a clip-in point) doubles as a stuff sack to bunch the jacket into. This isn't an especially compact jacket, so even when it's stuffed, it still takes up about the same space as my head; it would work well as a pillow. It also has a helmet-compatible hood, which doesn't hang over my eyes when worn without a helmet. The gusts we experienced on FM ripped the hood off from over my helmet a few times, but I easily put it back on with one hand. Additional features include nylon-woven mesh lining, an insulated wind flap and single-adjust hem. One drawback with the jacket is the concealed zippers on either side aren't easy to open with one hand. The fabric surrounding the zipper moves when I tug down on it, so I only make it about three-quarters open before the zipper jams. Three-quarters open is too narrow for my hands, so I use the other hand to hold the fabric in place to continue opening the zipper. Another con (especially for the tech-geek) is that the generously sized internal chest pocket—which also keeps electronics warm on cold days—is too light and limber to allow fast access to my phone when capturing climbing shots on the fly. Black Diamond backs this product with a 100 percent satisfaction guarantee. The company promises to "repair, replace or refund it" if you're not satisfied "for any reason."